One person on StackOverflow was asking in confused condition in midway after following a guide of Digital Ocean for self hosting email. Both DigitalOcean and Linode infamously confuse relatively new users with their paid to write guides for the sole intention to sale their virtual servers at abnormally higher price (yes). We think, such person is not alone, there are many such confused users. We Divided the Topic Hosting Mail Server in to 3 Chapters. Here is List of Mail Server Software For Installation on Cloud Server/VPS as First Chapter. We are talking about the backend and frontend web GUI with all modern functions including RESTful API. They will be like your own Gmail. Citadel – Easy and powerful mail server, it is under GPLv3 Licence and written in C. Web GUI does not looks great. iRedMail – Full featured mail server solution based on Postfix and Dovecot. Source Code is under GPLv3. They have a Pro version for support, extra features. 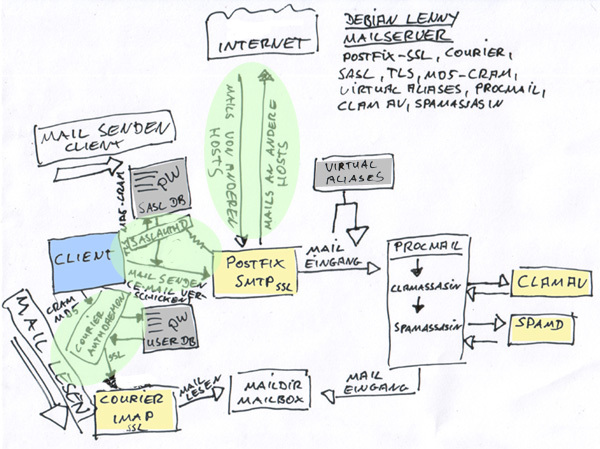 Mailcow – Mail server suite based on Dovecot, Postfix and other F/OSS software. It has a that modern Web UI for administration. Source Code is under GPLv2 and written in PHP. Modoboa – Modoboa is a mail hosting and management platform including a modern and simplified Web User Interface. Source Code is MIT Licenced and written in Python. Mail-in-a-Box is most modern from the point of security. iRedMail is most practical. We have not tested Xeams and Zimbra. We are not talking about the Mail Transfer Agents, Mail Delivery Agents, Webmail clients. There are more complicated and powerful Mail Server Softwares, we deliberately not listed. The above are at least known, has lot os users and guides on the web. Although Hosted Mail Server Software provides privacy, in very short, it is very difficult to not become a target of the spammers. Security of the server is a big concern. Networking connection of web host better be 1Gbps to 10Gbps, using a professional DNS management (like Dyn) is almost mandatory. It is really not cost and effort effective when solutions like SendGrid exists. WebHosting Talk, LowEndBox are perfect websites to get information on cheaper and powerful backend.As for virtual servers, cloud servers currently we recommend (based on our usage experiences) VPSDime – 6GB (OpenVZ virtualization) at 7 USD per month. Here is their website, click and contact them to ask whether they will allow to run mail server for handling mail server. Please invest time to read what we wrote about VPSDime in details and comparison OpenVZ vs KVM. Aruba Cloud’s 1 GB RAM VMware Instance costs 1 Euro per month. Aruba is big Italian Company. Also you should ask them whether they’ll allow to run mail server for handling near professional grade mail server. We have benchmarking for Host1Plus, OVH has many flavours. As for DNS, we talked about Dyn DNS before. Hurricane Electric Free DNS is free alternative. This Article Has Been Shared 4384 Times! Data Center and Choice of Storage for public cloud, Private Cloud or traditional data center, strategy can make the difference in performance and cost. Cite this article as: Abhishek Ghosh, "List of Mail Server Software For Installation on Cloud Server/VPS," in The Customize Windows, November 16, 2016, April 23, 2019, https://thecustomizewindows.com/2016/11/list-mail-server-software-installation-cloud-servervps/.